following the stories of people who have chosen to live on the road. The Meaning of Vanlife is an adventurous, revealing look into the Vanlife community through the eyes of nomads who have chosen to live a life of freedom on the road. A movement that exemplifies a deeper societal trend towards minimalism and authentic community building. Two of the central characters in the documentary are Kit Whistler and J.R. Switchgrass of @idletheorybus (read more about them below) who open up about the raw reality of life on the road, and share their lifestyle which they have distilled into an art form. Kit is a talented writer, and J.R. an accomplished photographer who both, respectively, manage to capture their adventures with a heightened optimism that transports you to the natural world they inhabit, and the joy with which they embrace it. Vanlife on the surface can appear to be a fad, driven by hashtags and vans in beautiful locations. After all, the lifestyle is inherently visual. But look deeper, and you see a diverse group of people who have made a conscious decision to downsize and live a simpler life on the road. Whether they are driven by economic pressures, a trend towards minimalism and simpler living, or just escaping the capitalistic fury of modern life, one thing is certain… they are aware of their decision to redefine their expectations for life. In the making of this documentary I also saw a darker side to Vanlife. People, down and out on their luck, being forced to live in their vehicles. Professionals forced to live in their cars in urban environments due to spiking rents. Poverty stricken grey nomads, working for pennies a month, assembling products for Wallmart. This is not what this documentary is about. This documentary is about people who make a conscious choice to live a simpler life on the road. 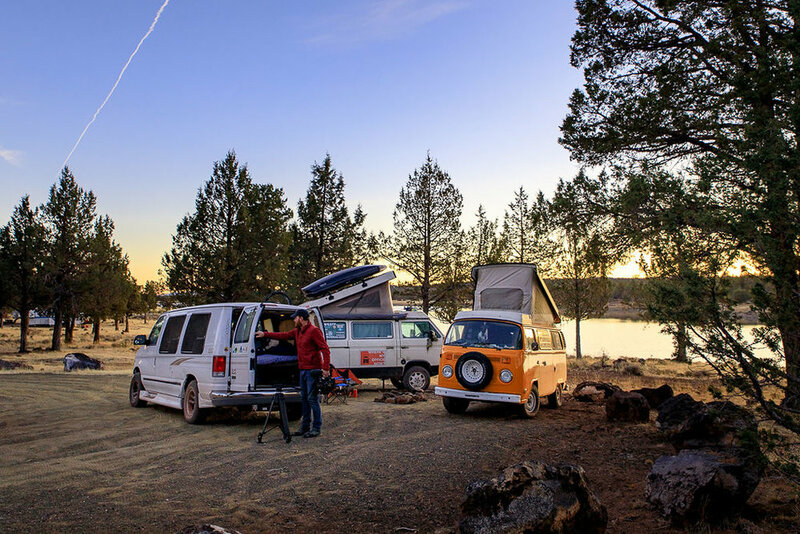 Jared Campbell and Jonny Dustow, founders of the Vanlife Diaries community are long-time friends, and in 2016, when Jared told me about this 'little' online community he had started with Jonny, I was curious. "It's growing like crazy, mate" he said, telling me about how he was planning to live in his van for a while, and organise gatherings for “vanlifers”. A few months later, I checked the @vanlifediaries Instagram account, and at that time it already had in excess of 130,000 followers. Now it is approaching 500,000 followers, and by Jared's own admission, has grown into a community that they struggle to keep up with. Every day brings a deluge of emails, photos and stories coming in from all over the world. This is why they decided to run van gatherings. To connect, in person, with those who were popping up on their social feeds. In late 2016, I experienced my first Vanlife gathering, to get a closer look at the community. Within hours of arriving, I knew I wanted to make a documentary about people who have chosen vanlife as an alternative lifestyle. The first night I was there, a group of about 50 people gathered around the fire, and listened as Aunty Esther, a local Aboriginal elder, who told stories about the area in North NSW where we were camping. This was done as a partnership with Yarn Australia, a reconciliation program that helps to facilitate an understanding of Australia's shared history. The whole event was alcohol free, and I watched as all 50 people, myself and my 9-year-old son included, listened with rapt attention about the trials and triumphs of living on the land. About coming to terms with indigenous tribes sharing their land with settlers. About how happy Auntie Esther was to be able to share their dreamtime stories. Director Jim Lounsbury looking through some footage with with Kit Whistler of @idletheory bus on the documentary trail. This is just one event of dozens that have been run by the Vanlife community over the past few years. This event hosted 25 odd vehicles (not everyone was in vans, some were in tents or slept in their cars) and 80 or so people. Other events have attracted as many as 200 or more vans in Australia, and 500 or more at ‘Descend on Bend’ the largest vanlife gathering in North America, which I also had the joy of visiting during the filming of this documentary. The community is comprised of an eclectic mix of people: Professionals who are taking a hiatus from their jobs in the city, Millennials who opt to live a more carefree life without the financial burdens of rent or mortgages, Environmentalists who are traveling school to school teaching children about conservation and sustainability, social and environmental entrepreneurs, and people who are just interested in sharing stories, music and connecting with other likeminded souls. Director Jim Lounsbury getting his gear out of his van ‘Hunter S. Thompsvan’ while on the documentary trail. Photo by J.R. Switchgrass. This film, for me, was a chance to examine why the vanlife community has struck a chord with so many. It is a chance to give the Vanlife community another avenue to communicate and share stories of people living on the fringe of capitalism, and show how people tend to build communities around the things they love to do. I have a firm belief that wherever this many people gather, there are resonant beliefs, philosophical truths and important new ideas to be found, and this documentary has been a journey to discover and share what those are. Over a tepid coffee in 2015, Jonny and Jared started sharing the stories of people they were meeting on the road while living in their vans. Only a few years later, their stories had attracted over 450,000 worldwide followers, and tapped into a growing community of people living on the road and off grid. 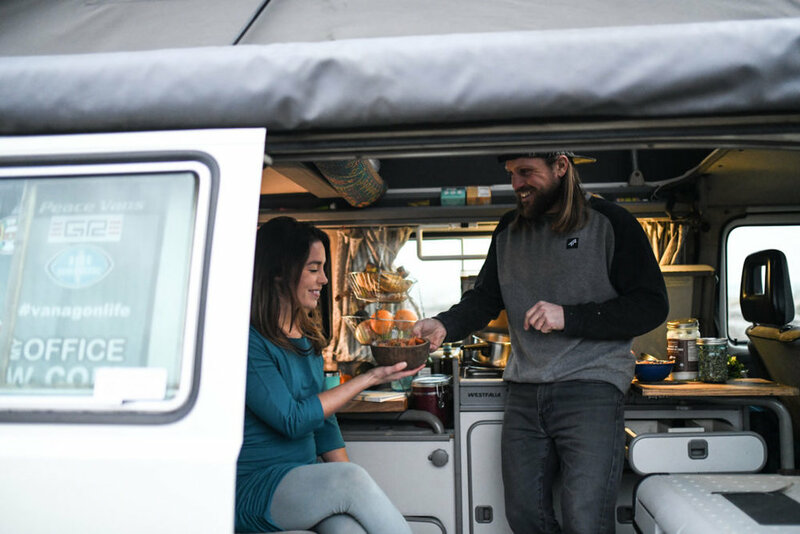 The Meaning of Vanlife follows Jonny and Jared as they set out to connect with with 'vanlifers' around the world to discover the spirit, struggles and philosophies that define the movement. From the simplicity of sharing music and stories on the road, to a sociological discussion about why movements like Vanlife are so important - this documentary gets it's wings from the perspectives within the community itself, in an adventurous, revealing look into a global phenomenon. Living the last 6 years on the road full time in a Van has allowed me to take my sense of home to explore the places I love. I feel a sense of freedom and adventure when I can wake up by the ocean and surf one morning, then follow a winding river to the mountains to park up and camp that night. It has been an inspiring lifestyle for me where I can share my original music and connect and build community with likeminded people through road trips and help organise Vanlife community Gatherings in Australia and overseas. I have been a part of the Vanlife Diaries team and a co founder since its very beginnings in 2014 with my good friends Jared & Sam. We have held 8 Vanlife Gatherings around our beautiful country so far and then networked and worked with some amazing members of our community especially with our American team member and cofounder Kathleen to run an international tour of events in 2017 which became a part of the initial filming and road trip adventure to capture real life and honest stories and share meaningful experiences with our international Vanlife community in the road for ‘The Meaning of Vanlife’ documentary by filmmaker/director Jim Lounsbury in partnership with Vanlife Diaries. This filming journey started in Australia with two gatherings then headed overseas connecting our community in Canada, America and Berlin, Germany. A big part of my personal purpose and passion in life is helping to grow and build authentic and supportive relationships with the Vanlife community where we can share real life stories and feel comfortable to be our raw and honest selves sharing both the good and bad experiences in life and have deep connections with like minded people uplifting and inspiring each other to contribute and be the best version of our selves whilst looking after the natural environments we gather on and have a minimal impact to the land. Ever since I was a boy, I dwelled on the fringes of society. I find that’s where my people are. The musicians, the seekers, we all have a common story of separation, vulnerability, resilience and unity. You see, it has always confused me of how I can live a happy conventional life, yet work and participate in an economy that disadvantages the less fortunate, harms the environment and divides us as a species. Everyone has compromises. That’s where ‘vanlife’ helps balance how I can function happily in the world, give back to society in a way that nutures community and adds value to individuals lives, and mine. We are all trying to make sense of our own journey and I want people to know in the depths of their hearts how valued and uniquely wonderful they are. To be a part of a team of friends striving to connect and reconnect, helps me live within the beauty of what we can have immediately. 'The Meaning Of Vanlife' is the story of humans living a life of their own design, just like me. Jared Melrose Campbell is a musician and has been living full-time in his van for four years with his partner, Ashleigh. He is a cofounder of Vanlife Diaries since its germination in 2014 with lifelong friends Sam and Jonny. Jared curates multiple vanlife gathering events in Australia and Internationally, working with sponsors on brand development and media awareness. He converts vans into beautiful living spaces for the community with Sam, and loves to cook delicious and nutritious meals with his darling Ashleigh. The Meaning of Vanlife is a project I’m so happy and grateful to be involved with. It’s a beautiful thing to shed light on such a rich, diverse worldly community. Travelling over to meet a such a large part of the community in Canada and the USA, and road tripping to each event we held was incredible and fulfilling. Being able to meet with personalities we had connected with through social media and experience the stunning environment they live in was very special. It was like spending time with one big likeminded family. I come from a background of working in events, music festivals and being a musician myself which is how I came to know Jared and Jonny. Jared and myself also work getting people on the road through our Vanlife Conversions. We fit out custom camper vans tailored to the personal needs. Living in a van has always been a part of my existence and I have getting so much from the time spent in nature and on the road, on the coast of Australia and through national parks and other wild places. The freedom and sanctuary of this alternate lifestyle soothes my soul and gives me such good perspective on how I see myself move through this world. I hope that this documentary can give the world a deeper insight into what it is to live this way and through the stories of people within the community, a greater understanding of what Vanlife means can be formed and maybe even explored. In short, to inspire. I am so grateful to be a part of The Meaning of Vanlife documentary. It's not only a film, but also a project our friend and filmmaker Jim Lounsbury poured his soul into. Words can not describe the magic of the summer of 2017 when the Vanlife Diaries team caravanned around Colorado. It was incredibly special to have Jonny, Jared, Sam and I together even though we live on opposite sides of the globe. My journey living small began back in 2013 when I began to examine non-traditional ways of living. I feeling trapped in a city, working a 9-5 job and escaping on the weekends to the mountains. When I did take those trips into the wilderness, whether for a short hike or a backpacking trip, I started to regain a part of myself that was lost. There was freedom in going out on an adventure with just the items on your back and it felt good to know I could be self-sufficient with less. I hope my story of living off grid in a camper trailer resonates with someone who is considering an alternative lifestyle. You don't have to quit your day job to live more simply and you can be an environmental steward no matter where you live. But going off the grid is a lifestyle change that allows you to be more eco-conscious everyday. And if you are able to do so in one location for longer periods of time, you can decrease the carbon footprint you would have driving to and from a job. When we live more intentionally, we can reduce our reliance on fossil fuels and conserve essentials like electricity and water. And when we use the land as a guide and a supplier of our food, we have found a more sustainable lifestyle. Jim does a wonderful job of sharing several important messages within the film and I hope you are inspired in some way to make small changes to better the environment and connect with the natural world. I will continue to encourage others to be environmental activists on the road or in their communities through my personal project, Tiny House, Tiny Footprint. It is on that platform, that I share my journey as well as others who find joy in the outdoors, traveling and environmental initiatives. Since 2012, We’ve traveled, lived and worked on the road full time. We’ve been all over the United States, from the red rock deserts of Utah to the lush greenery of the Northwest, seeking out wild spaces where human development hasn’t yet encroached. Our income comes from gigs on all sorts of farms. We are a type of traveler traditionally known as a hobo or a migrant laborer. From fruit harvests to milking goats and digging ditches, we’ve pieced together temporary physical labor jobs, traveling with agricultural seasons and seeking, above all, balance between the mind, body and spirit. Idle - time spent doing nothing. Work - time spent on survival. Leisure - time spent pursuing passions. Modern society, and the people that live within it’s paradigm, greatly over-value work. The modern person defines themself by their work-related achievements. They devote the majority of their time to work, ignoring or neglecting both leisure and idleness. This leaves us imbalanced and unfulfilled. We believe that, through limiting our work time, and the material possessions acquired through work, modern man can reclaim his leisure and idle time. Doing so, he transforms into a balanced, whole human BEing. If we all shake our work addiction, and the stuff-addiction that accompanies it, the major problems of modern life will disappear. Where’s My Office Now? began as an experiment in January 2013. We wondered… is it possible to live an adventurous nomadic lifestyle and work remotely? What challenges and opportunities will arise? What will we learn and will it be worth it? And so we wandered, on a quest for adventure, freedom and truth, and funding it through remote web work. and new friends that feel like family. So much has changed since we left our home in snowy New England six years ago. Mostly, we’ve changed. We now know that anything is possible and nothing is guaranteed. With each mile, step, and breath down the road, we are continuously inspired by the worldwide community of modern nomads and this beautiful Earth we call home. We are the writers of our story. Enjoy the journey. Irie: a state of feeling great. For the past 3 years this is what we’ve been seeking. We’ve found it down dirt roads through evergreen forests, followed it up scree fields to mountain summits, glided along with it on ocean highways. We started this journey in 2016 with the intention of redefining what success and happiness means to us. You see, society teaches that what people do and what they own are the sole components for measuring success. And most individuals go through life measuring their worth and that of others through this limited vantage point, dismissing anything that falls beyond these narrow parameters. Living on the road, we’ve discovered ways to reconnect with our true and higher selves. By simplifying and adopting a lifestyle of minimalism, we’ve made room for the things that fuel our souls. For us, this means living in harmony with the natural world. We believe that when we are able to recognize the underlying unity we have with the natural world, we begin to cultivate a deep level of compassion for ourselves and all beings. As such, we are able to grow and live freely, allowing others to do the same. Through this, we naturally find ourselves wanting to protect all living things. Sustainability in everyday life has become our mantra. We’re creating a lifestyle that is simple and uncluttered - by eating healthy foods, becoming conscious consumers, advocating for the higher good of Mama Earth and all her inhabitants, and encouraging others to do the same. Through this we have found a burning enthusiasm and an ability to feel satisfied with our immediate experiences. We are proud to be a part of the Vanlife community, and we’re truly honored to share some of our story in this documentary. The filming gave us the opportunity to connect face-to-face with like-minded individuals - the ones who are creating a shift in what it means to be wealthy. This experience was truly inspiring and life changing, and we hope these stories inspire you.